Celebrating 130 Years of "Love & Service"
What a wonderful year of celebrations we have enjoyed in 2017 both at All-Ireland level and in our United Diocese ~ Afternoon Tea Parties, Prayer Services, Tree Planting, The MU Way, Triennial Conference in Termonfeckin and The Big Sing to namer just a few. Click on the picture on the below to bring you to Leighlin Area Web Page and a slide Show from the MU Way. It was a great privilege to have Lynne Tembey, World Wide President, with us in Old Leighlin for this special occasion as Phyllis Grothier, our All-Ireland President, visited every Diocese in Ireland as part of "The MU Way". What a wonderful, inspirational occasion this was. The Big Sing took place on Saturday September 9th in The National Concert Hall, Dublin. 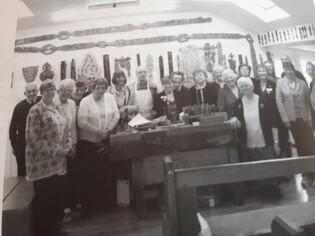 The Big Sing was a dream of Phyllis Grothier and with the help of all those on the 130th Anniversary Planning Team of Phyllis Grothier, Jacqueline Armstrong, Moira Thom, Mildred Gilmore, Avril Jennings, Lucy Kavanagh, Myrtle Allen and May Boyd, the dream became a reality. A choir made up of over 120 MU Members, 10 from our own Diocese, and 1000 voices in the main body of the Concert Hall sang many much loved hymns with gusto. The choir was conducted by Mark Armstrong and the organist for the event was Peter Barley. Trumpets and a Timpani really added to the quality of the music. The hymns were very ably introduced by Bishop Ken Clarke who also interviewed some members about MU Projects. We were also treated to two lovely pieces played on the harp by Anne-Marie O'Farrell ~ "Take my Life and Let it be" and "Blest are the Pure in Heart"
The 2018 Women’s Getaway took place on 12th - 13th October in the Cavan Crystal Hotel. It was a great success with 85 women and one gentlemen enjoying a lovly meal on the Friday evening and 101 participating in events on the Saturday. It was a lovely weekend of chat, fellowship, joining in different activities and good food. Congratulations and very well done to all the organisers of this event. 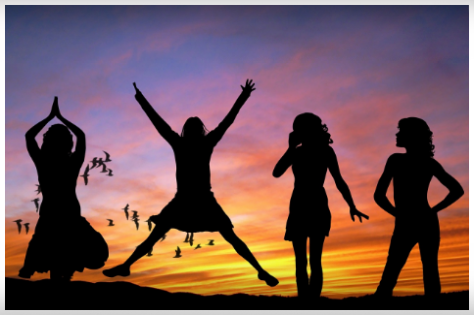 The Women's Getaway in 2019 will take place October 18th/19th in The Armagh City Hotel. On Monday 17th September 2018, 9 members travelled from Rosslare to Fishguard on the calmest sailing imaginable, and on to Swansea by mini coach where we spent the afternoon before the service in the beautiful Collegiate Parish Church of St. Mary's, a wonderful building seating 600 people. The Archbishop of Wales, The Most Revd.John Davies, The Bishop of St. David's, The Right Revd. Joanna Penberthy, The Lord Mayor of Swansea and other dignitaries were present. We were welcomed by Canon Ian Rees rector of Central Swansea, the address was given by the Right Revd. 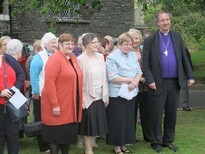 Joanna Penberthy and the blessing was given by The Archbishop of Wales. Phyllis Grothier joined us after the service for the remainder of the trip. On Tuesday we attended the General Meeting in the very impressive Brangwyn Hall. We were welcomed by the Lord Mayor of Swansea David Philips who spoke about Swansea as the city by the sea. The hall was built in 1929, the 952 anniversary of the Vikings invasion of Wales and Britain and 3000 people were involved in building it. The walls are adorned with the beautiful Brangwyn panels commissioned by the House of Lords to celebrate the end of the 1st world war. 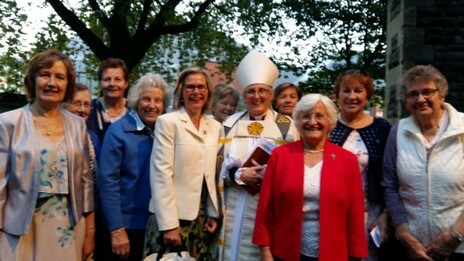 The opening service was with the Archbishop of Wales who spoke about being harassed and helpless like sheep without a shepherd, he said that the 23rd psalm is really a call to change and renewal, to follow God in new ways and to renew our vision of Mothers' Union and be ready to help in new and challenging ways. Our Worldwide President Lynne Tembey gave her last presentation as she finishes her term of office at the end of the year. She spoke about faith in Action which is working in 84 counteries worldwid. 650 thousand people have been helped get out of poverty unemployment and injustice so far and by 2021 1 million people will have been helped worldwide. She said, "be strong in The Lord and give everything to God in prayer", this is what gives her strength. Bev Jullien Chief Executive spoke about the revised constitution updated in April and agreed by Her Majesty The Queen. She went on to talk about MULOA which is Mother's Union Listening Observing Acting. She then spoke about Lynne's wonderful leadership from 2013 to 2018 the businesses women in Rwanda, Kenya, Harari and other places have set up all with the help of MU. which is a golden thread in our branches and communities. We then had midday prayers a break for lunch and a visit to Joe's famous ice cream parlour. The keynote speaker in the afternoon was Revd. Rachel Carnegie who was very interesting. This was followed by a special farewell for Lynne in the form of a "this your life" presentation by David McAllister. She was accompanied by her husband on stage and we were shown all the places she had visited during her 6 years. Lynne spoke about how much she enjoyed visiting these peoples across the world experienceing the diverse cultures and the way MU had changed their lives. She also mentioned enjoying her visits to Ireland for the 130 anniversary celebrations "walking with Phyllis" and the Big Sing. It was wonderful to see all she accomplished in the past 6 years. She was presented with bouquet of flowers. The Meeting closed with worship with Right Revd. Andrew Proud MU Central Chaplin. 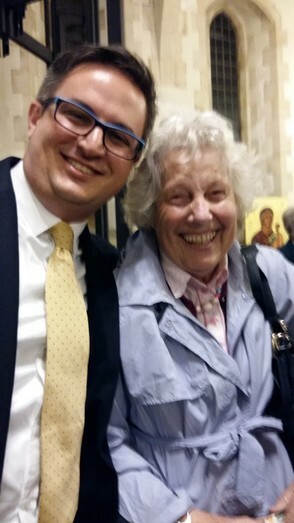 That night we attended a wonderful Welsh Choral Concert in St Mary's Church the singing was amazing with Morriston RFC Male Choir, Parti Llwchwr Ladies Choir and Iona Jones soprano. Our homeward sailing was delayed due to bad weather , but all was not lost as we had a lovely afternoon in Carmarthen and sight seeing with our driver Jim . We arrived home a bit tired but had a very enjoyable time together. "Roll on Portsmouth next year. " Many thanks to Olive Powerfor this report and we all appreciate the thought, time and effort Olive puts into making travel and accommodation arrangements for this outing every year. On Friday 20th April 11 people (10 ladies and one gentleman) sailed from Rosslare to Pemproke. We had a very pleasant, calm crossing and arrived to warm sunshine in Pembroke where we were met by our hosts. We spent the afternoon and evening with them as they showed us around their area and had our evening meal in their homes. On Saturday morning we visited The Longest Lovespoon Workshop which was very interesting, seeing how they are made and the history behind giving lovespoons. After lunch we went to Picton Castle for a tour of the 13th Century castle, spent time in the beautiful gardens and saw the owls there. Following this we went to church and had prayers and some quiet time. We then went to the Begelly Arms Hotel for a lovely evening dinner followed by some light entertainment from our Welsh hosts and Irish ladies. On Sunday morning we attended church with our hosts, had lunch with them and then they brought us back to Pembroke for the afternoon sailing home. It was a wonderful weekend meeting such lovely people, sightseeing, being entertained and, of course, the lovely sunny weather really made it! We look forward to renewing friendships with our Welsh friends in the coming years. 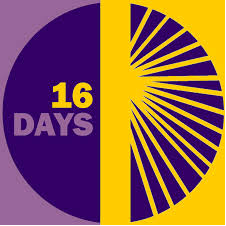 The Sixteen Days of Activism Against Gender Based Violence is observed by Mothers' Union members throughout Ireland. From 25th November, the International Day for the Elimination of Violence against Women, to 10th December, Human Rights Day, the 16 Days of Activism against Gender-Based Violence Campaign is a time to galvanize action to end violence against women and girls around the world. The international campaign originated from the first Women's Global Leadership Institute coordinated by the Center for Women's Global Leadership in 1991. God of justice, God of mercy, God of healing, we acknowledge the pain and brokenness of our world. We pray for those who suffer degradation and violence through gender based violence. We pray for those whose minds are warped by the need to control and imprison others in a world of cruelty and violence as a means towards self-gratification. As Mothers’ Union members, embed deep in us the courage to step out in faith, to stand alongside the victims, to dare the risk of challenging the status quo by speaking up for those who cannot speak for themselves.